Home decorating, like any art-related field, has gone through its own plethora of trends that the general population just love to follow. From the craftsman-style homes of the early 1900s, the flashy and geometric Modernist homes of the 1920s, the radical mod shapes and popping colors of the ‘60s, the prevalence of the mustard color in ‘70s homes, the ’90s floral patterns, and the sleek white kitchens of the 2000s, trends have evolved throughout the years and have been marked with some of the most iconic pieces both in and outdoors. They can be made from vinyl, aluminum, or wood, and provide a clean yet attractive image towards the house’s overall look. It also increases a home’s defense against the various forces of nature that can cause premature deterioration when not helped prevented by the sidings. If you’re thinking of adding sidings to your exterior walls, you don’t have to settle for expensive options because there are lots of less costly ones that will help save money that you can pour into the maintenance of your beautiful sidings! 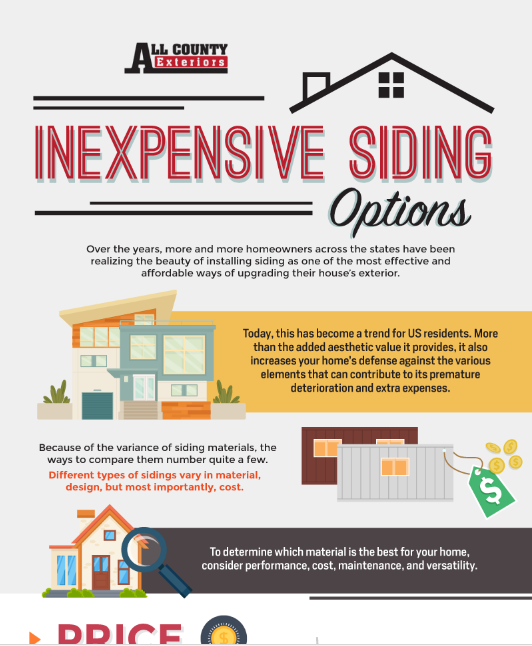 Check out this infographic by All County Exteriors to learn more.